When the Burlington & Missouri River Railroad (now the Burlington Northern-Santa Fe) reached this point in 1887, it built a siding named Hecla after a volcano in Iceland. A post office was established the same year, and construction of stockyards and a depot made Hecla an important shipping point for Sandhills cattle. About 1911 Bill Gottlob and L. E. Fay acquired land from the UBI Cattle Company and built a general store and lumberyard. Hecla also had a school, livery barn, and pool hall. Migrant workers, railroad crews, surveyors, and ranchers shipping cattle frequently increased the small, permanent population. When travelers overflowed the sleeping quarters in the store, they slept in the schoolhouse or livery barn. Although the Gottlob store burned in 1927 and the depot closed in the 1930s, cattle continued to be shipped from Hecla. The post office and school closed in 1952 and the schoolhouse was moved to Mullen. The depot became a private residence. The railroad kept a repair crew in Hecla until 1956. The depot and stockyards were removed in 1967 and Hecla was no more. 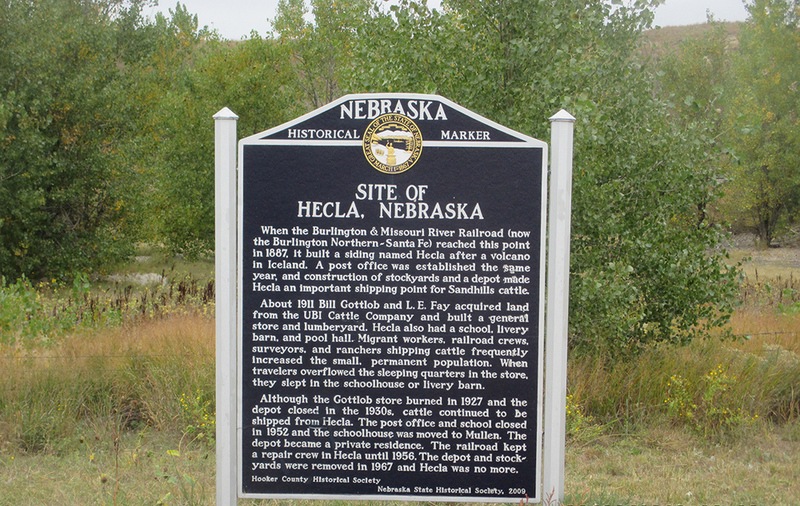 “Site of Hecla, Nebraska,” Explore Nebraska History, accessed April 19, 2019, https://mynehistory.com/items/show/284.